KATHMANDU, Jan 9: Stocks traded mostly in the upper side in early trading hours on Tuesday. The Nepal Stock Exchange (Nepse) index, which crossed 1,180 points in the morning, however, pared its gains by mid-session. The index then fluctuated around the opening line to close the day essentially flat. Nepse posted a dismal loss of 0.40 points to settle at 1,177.07 points. 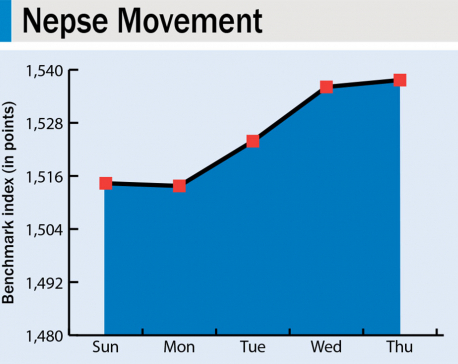 With Nepse closing the day unchanged, the index has closed within a narrow range between 1,170 points and 1,180 points for four straight sessions. As the stock market is consolidating, indecision remains fairly visible among investors in the short run. Subsequently, market participation continued to remain in the lower side of the spectrum. The bourse posted a turnover of Rs 432 million on the day. Traded sectors turned in mixed performance contributing to the marginal movement of the broader index. Among gainers, Microfinance sub-index registered a gain of 0.39 percent followed by Manufacturing & Processing sub-index which climbed up 0.23 percent. Sub-indices of 'Others' and Development Bank segments also closed slightly higher. In contrast, sub-indices of Hotels and Non-Life Insurance stocks came under pressure and shed 0.69 percent and 0.67 percent, respectively. Further, Life Insurance, Hydropower and Finance sub-indices also posted marginal losses. Meanwhile, Banking sub-index ended nearly flat. Market activity remained fairly dominated by shares of Nepal Bank Ltd which accounted for more than 25 percent of the day's total transaction. Shares worth Rs 88 million of the commercial bank were traded on the day. Similarly, Bank of Kathmandu Ltd saw Rs 13 million worth of its shares change hands. Further, Nepal Credit and Commercial Bank Ltd, Premier Insurance Company Ltd and NIC Asia Bank Ltd posted turnover of Rs 12 million, Rs 11 million and Rs 10 million, respectively. 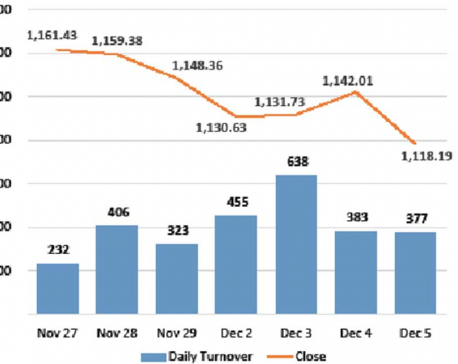 Arambha Microfinance Bittiya Sanstha Ltd led the list of advances and hit the upper circuit of 10 percent erasing losses coming from 14 previous sessions. Share price of Chautari Laghubitta Bittiya Sanstha Ltd, which started trading on Monday, also surged by 4.85 percent on the day. Salt Trading Corporation, Ankhu Khola Jalavidhyut Company Ltd and Ngadi Group Power Ltd's shares followed suit with advances of over 4 percent each. Saptakoshi Development Bank Ltd and Shine Resunga Development Bank Ltd were among other top gainers of the day. On the other hand, few microfinance stocks struggled during the day. Share price of NMB Microfinance Bittiya Sanstha Ltd tanked 6.85 percent, while Kalika Laghubitta Bittiya Sanstha Ltd saw its share price go down by 5.55 percent. Similarly, share price of Summit Microfinance Development Bank Ltd was down by 3.56 percent. Siddhartha Insurance Ltd and Api Power Company Ltd were the other top losing securities on the day. AS per the ARKS technical analysis, Nepse continued range bound trading with the index ending flat on the day. Technical indicators suggest sellers overcoming buyers slightly. Nonetheless, the overall sentiment remains fairly neutral. Hence, a breakout towards either direction from the consolidation range between 1,170 and 1,180 points can suggest a plausible direction for the market in the short run.